It's time to announce the Super Dad Giveaway winner! Congratulations to Greg from Reynoldsburg! "Greg is an amazing Dad because he is a selfless person. His motivation in life is a sincere desire to help others. Greg is a registered nurse and a foster dad, so he has many opportunities to help people who are suffering or dealing with hardships. He always goes above and beyond to offer assistance with compassion, and he knows the importance of incorporating laughter and positivity in his work. Greg is an amazing role model to our two sons, who are 8 & 2 years old. He loves them unconditionally, and he loves to share his passion for sports with each of them. Greg takes them to the hockey rink, to weekly Clippers games, to swimming lessons and flag football, etc, etc. Greg & I are ecstatic that both boys love spending time together & love to be active. We adopted our 2 year old son after he was abandoned in the hospital with a heroin addiction at birth. Our son has overcome so much, and Greg has been with him every step of the way since he was released from the NICU at 3 weeks old. I'm so thankful to Greg for instilling our boys with such strong values. Thankful for his love and for ALL of the sacrifices that Greg has made for our family. BEST DAD EVER... WE LOVE YOU!!" Well said Michelle! 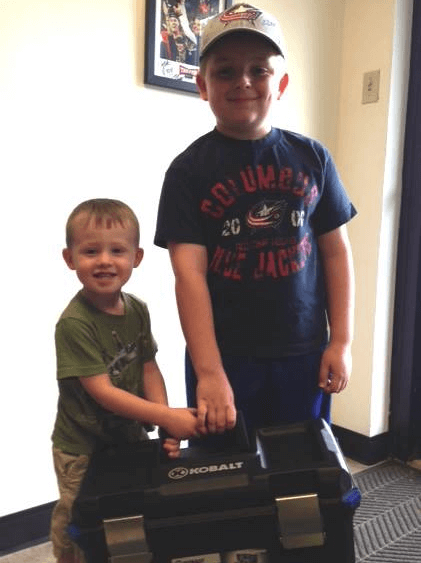 The family came to pick up their toolbox of gift cards on Friday...and as you can see the boys are very excited to bring this gift home for their 'super dad'! Happy Father's Day from all of us at Logan Services!